In 1992 Steinway and Sons released a new range of pianos under the Boston brand. 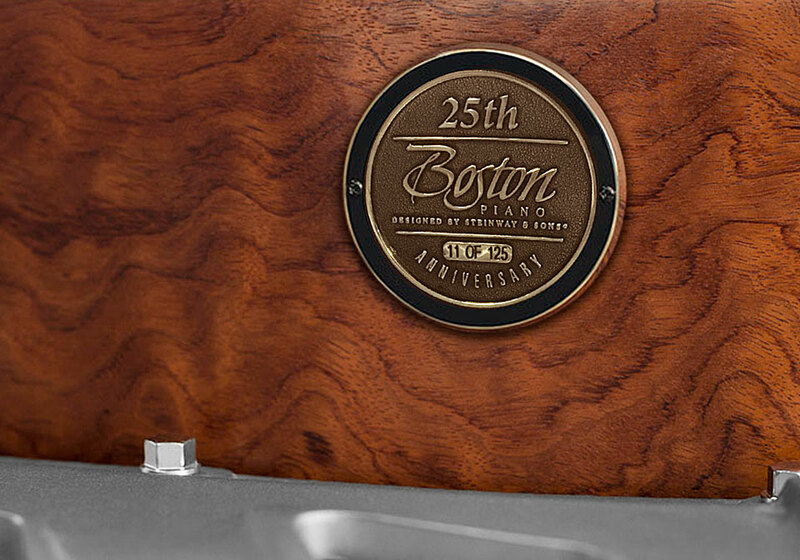 Twenty-five years on, and the company has produced 125 unique “Silver Anniversary” grand pianos featuring additions and enhancements highlighting the quality of the Boston product. The Boston “Silver Anniversary” grand piano with silver-toned plate casting. Boston grands and uprights are designed by Steinway, and utilise many of their patented features, but are manufactured primarily in the Far East (mostly in Kawai’s Japanese factory). A Boston piano, however, has a more mellow, mellifluous, sound than the brighter timbre of most Asian instruments. With lower production costs, a Boston piano is more affordable than a Steinway. 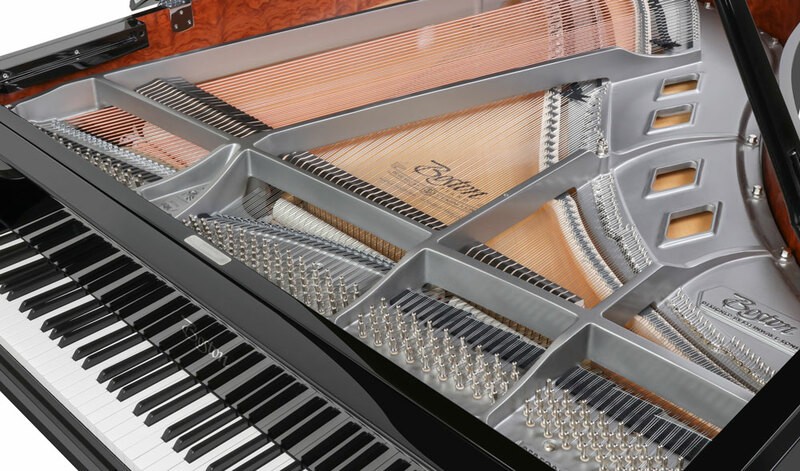 Steinway originally introduced the Boston range so the company could offer a broader catalogue, but without devaluing the company’s exclusive brand. The introduction of the Essex range of entry-level pianos further widened the gamut of instruments Steinway could offer. Earlier this year the original Boston Performance Edition was upgraded with a host of cosmetic improvements and “a rescaled bass and treble wire lower string tension to provide increased sustain, better tone clarity and a deeper clearer bass“ (Steinway). It is the 5’10” Boston GP-178 Performance Edition II parlour grand that has received the Silver Anniversary celebratory makeover. 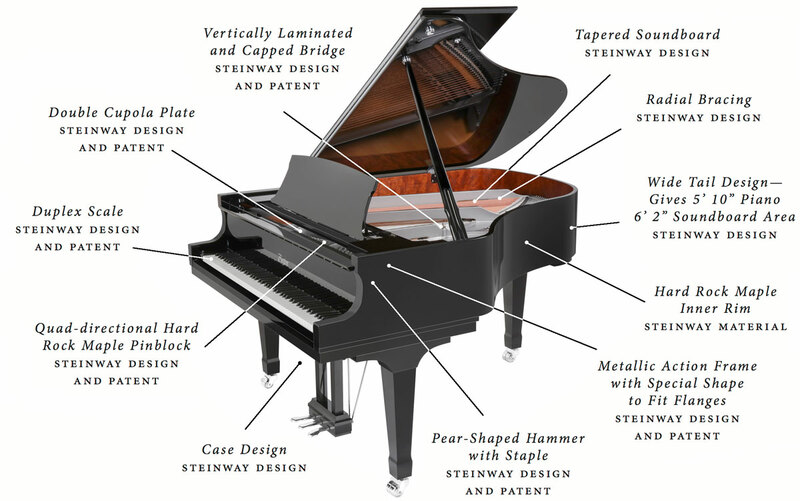 Key features of the Boston “Silver Anniversary” grand piano (click image to expand). The 125 limited edition instruments feature an attractive silver-toned plate casting, and nickel-plated hardware (agraffes, pedals, hinges, and castors), giving a cool, classy, and, of course, “silvery” style. Each instrument also features an individually numbered commemorative medallion. The individually numbered limited edition medallion. A limited edition is always something a bit special. The price? In New York the retail price is a very reasonable 32,000 USD. This will vary by state, and by country (differing tax rates, exchange rates, import taxes and shipping charges, etc. ).